Key Difference: Antenna is an electronic device which is used as a transmitter or receiver for electromagnetic waves. They are generally divided into many types depending upon factors like frequency, apertures, polarization or radiation. Antenna or aerial refers to an electronic device used for transmission of radio or other electromagnetic waves. It converts electricity into electromagnetic waves. Antenna was firstly built by a German physicist named Heinrich Hertz. Antennas are very important parts of an electric system as they play the role of a connector between the transmitter and free space or free space and the receiver. It is used for focusing waves into a narrow beam for transmission. It collects the signals for the receiver end. Antennas are employed in various systems and in different forms like in radio and television broadcasting, point to point radio communication, wireless LAN, radar, etc. Transmitting antennas are used for radiating electromagnetic radiation in a desired direction, whereas a receiving antenna receives electromagnetic radiation. Size and shape of antennae is in accordance with the size of the signal’s wavelength. Dipoles and Monopoles - These antennas are greatly preferred in the field of wireless communication due to their omnidirectional feature and low cost. Monopole antenna is half of a dipole antenna. Monopole uses a ground plane in place of the second wire. A dipole antenna is made by using two terminals. Radio frequency current slows into these poles. The poles are symmetrical and are of equal lengths. It extends in just opposite directions from the feed point. Monopole antenna possesses a single element. These are very easy to build and install, and therefore have gained some popularity. They can be installed in various forms like in commercial flat top versions. A typical gain for a dipole antenna is 2dB, and the bandwidth is generally around 10%. 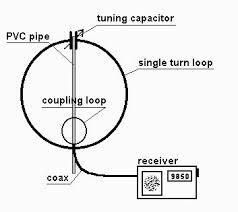 Loop Antenna – This antenna is generally designed for AM broadcast and the Long wave lengths. It is directional. They are further categorized into small loop and large loop types. Usually, these antennae are small in size. It is made of a conductor which is bent into the shape of a closed curve like a circle or square. The larger the size of loop antennae is always considered to be better. One wavelength perimeter loop works like a folded dipole antenna. However, its impedance is greater than that of half wavelength dipole antennae. Multi turn loop antennas are not good for transmission due to high losses and high level of heat dissipation. 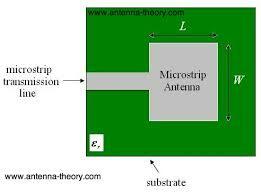 Microstrip Antenna –These were invented by Bob Munson in 1972. These antennas became highly popular during the 1970s. These antennas are also known as the patch antennas. Patch refers to the rectangular component which is photoetched from one side of the board. The majority of elements are fed by a coaxial conducted which is soldered to the reverse part of the ground plate. It can be considered as a planar antenna which is separated from a ground plate by a dielectric medium like air. Their simple 2 D physical geometry and design makes then inexpensive and easy to manufacture. 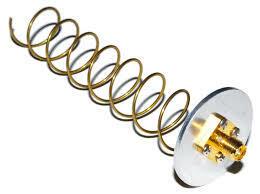 Helical Antenna –These are also known as helical antennas .A travelling wave antennae which is shaped in the form of a corkscrew is a famous type of helical antennae. Its wider bandwidth and easy construction are two key benefits. The current in these antennas travel along the antenna and the phase keeps on changing continuously. It works best of pitch angles between 12 and 14 degrees. Unlike dipole, which radiates normal to its axis, these antennas are circularly polarized. Horn Antenna – Its flared appearance is the reason behind its name. They operate as high as 150 GHz. Usually they are used as microwave antennas. Its performance is easily controllable. They possess a directional radiation pattern with a high antenna gain. They exhibit very little loss. It is usually used as the active component of a dish antenna. This antenna is generally used in unification with waveguide feeds. It is generally made of a small rectangular cylindrical metal tube which is closed from one end. This tube flares into an open ended conical or pyramidal shaped of horn from the other side.